Comprehensive review of Shiseifo Brilliant Bronze Tinted Self Tanning Gel. See what real experts and actual users have to say about this self tanning product. I think this is the worse self tanner I’ve tried, so I gave it 1 out of 5 stars. My first red flag was the texture of this product. It says it’s a gel but comes out as a liquid with little shimmer beads in it. The liquid soaks into your tanning mitt, leaving just the beads that look like mud. Due to the muddy texture, applying it is so hard, and the product balled up and got all over my bathroom. The smell is nasty, and the color produced left much to be desired. Oh, and it costs $60 per bottle, talk about a rip-off! So, I’m not a fan of Shiseido Brilliant Bronze Tinted Self Tanning Gel…hence the 1 star rating. Shiseido Brilliant Bronze Tinted Self Tanning Gel is supposed to be a gel, but it’s definitely not. It sounds like water sloshing around in the bottle. And when you pour it out it comes out as a liquid with little chunks in it that look like mud. It has these little beads that just sit on top of the mitt and don’t dissolve. The color of the product is an orangey brown color, it looks like sometime gross that I don’t even want to say (haha). Honestly, the texture and feel is disgusting. This one is a nightmare to apply, and that’s putting it nicely. I used a tanning mitt, and the liquid part soaked right into the tanning mitt, leaving the chunks of mud looking product sitting on top. So I was left rubbing what looked like mud into my skin. As I applied it, it balled up and was falling all over the ground. It stained my marble tile and my grout. I was finally able to blend a little bit into my skin and it was shimmery and orange looking. This product is so weird, because the part that you blend into your skin is almost a solid. After I was finally able to apply this product it took far too long to dry. It took over 40 minutes and I felt extremely sticky while I waited. I also, had to be vey cautious as I waited because this one stains whatever it touches. Shiseido Brilliant Bronze Tinted Self Tanning Gel smells terrible. It smells so strongly of DHA, kind of how self tanners smells 20 years ago. It smelled up my whole bathroom, and I couldn’t get the smell out. Yep, you guessed it…the DHA smell just got worse as the product developed. It was overwhelming the next morning, it smelled so badly. The next morning I work up and there was shimmer/glitter everywhere! What a pain. When I showered off the tanner, I was left with a light to medium shade tan. It was personally too light for me, but the tan itself wasn’t too bad. You’ll need to apply this one two days in a row for a medium tan and probably three days in a row for a dark tan. That’s just too much work, especially for the hassle of applying this one. The color was pretty natural looking, maybe a little orange. The color produced just isn’t enough to redeem this one. My tan started fading after 2 days and was completely gone after 4 days. Talk about a let down. I was disappointed with how long Shiseido Brilliant Bronze Tinted Self Tanning Gel lasted. No. Run far away from this one, men. This one is SO expensive. Shiseido Brilliant Bronze Tinted Self Tanning Gel is $60 per bottle! Does it come with gold in it? 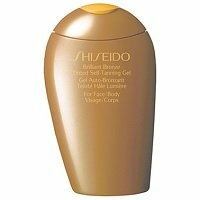 To buy Shiseido Brilliant Bronze Tinted Self Tanning Gel, Click Here. Look and Feel It’s a liquid that separates, and has little beads that look like mud. Application Applying is so messy and I stained my bathroom. Drying Time It took over 40 minutes to dry and I felt sticky. Smell (Before) Smells disgusting, like pure DHA. Smell (After) The DHA smell got even worse as it developed! Color Produced I had a light to medium tan that looked pretty natural. How Long It Lasts It was gone by day 4. OK For Men? No, I don’t think men will like anything about this tanner. Price It’s over $11 per ounce, definitely not worth it.